From the start Carl Bell and James Logue were conjoined, with Tom Brunt a few paces back. That was pretty much the story of the first half, but things changed at 'Geronimo' where Andy Brown brought Daz H (Darren Holloway) down an obviously better line, putting them in touch with the leading pair of Carl and James, relegating Tom a close fifth. 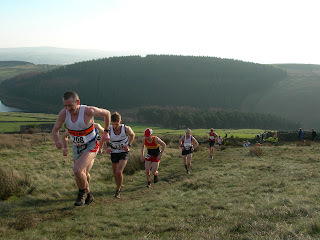 Paul Thompson, Matt John and Daz H on the first climb. FRB's roving reporter next caught the action on the first of the three climbs of the second half, where Carl and James had extended their lead, with both looking very strong. 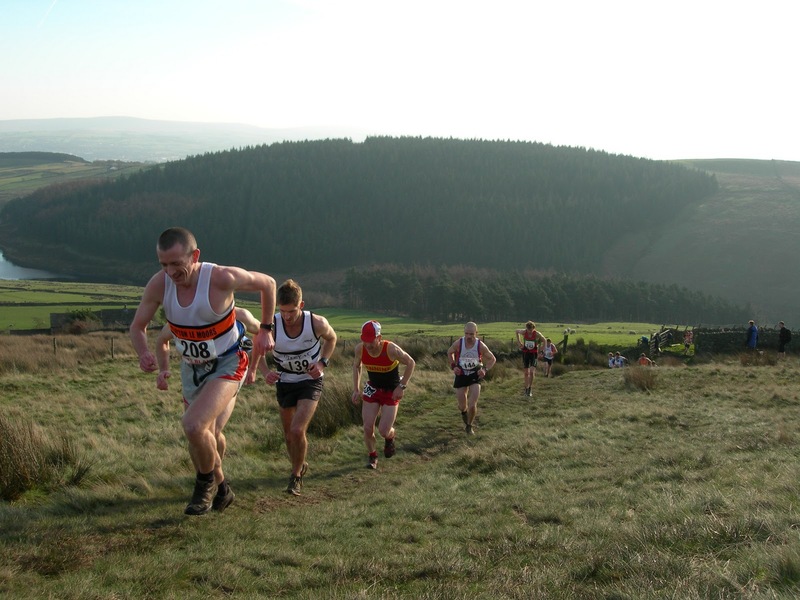 On the second half's second climb, Pete Hartley reported that Carl had taken a decisive lead. Speaking to Carl after the race, he told us he was too unsure of the route to make a break allowing James to get back to him. In fact, he wasn't sufficiently confident to make a dash for the line until he could see "Geronimo" ahead of him, guiding him to the final checkpoint. Carl told FRB that at this point he put his foot down as he did not want a sprint finish with James down the final road. That Carl pulled out over two minutes over James in the last 2 and half miles, shows that he really was in charge of the race. FRB - "So Carl, how was it today - another win!" 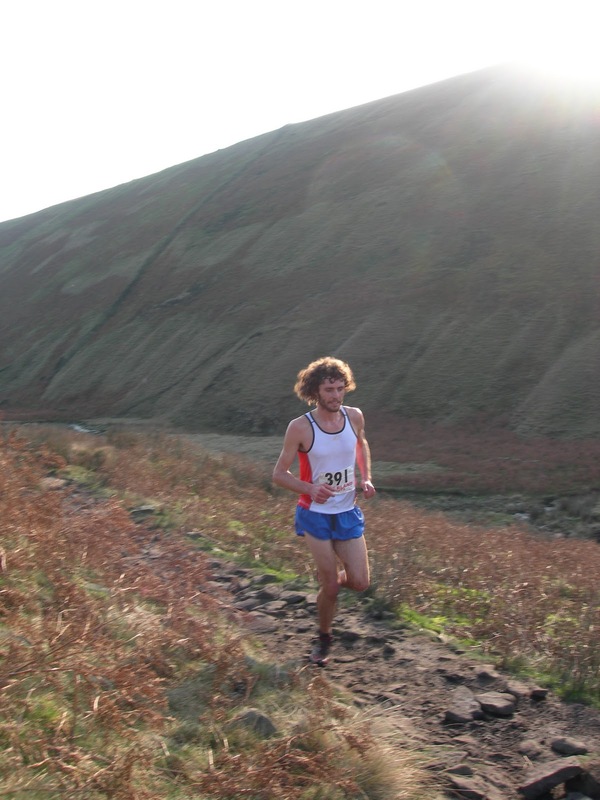 Carl - "Yeah - I woke up this morning and thought it's a nice day, I think I'll go and do a race"
Holmfirth's Tom Brunt interjected at this point "Don't you Cumbrians know the rule, you're not allowed to run outside the boundary of Cumbria!" Clayton's Andy Brown then said - "what are you doing over here then Tom, you're from Yorkshire!" FRB - "Oy you lot - clear off I'm talking to Carl here. 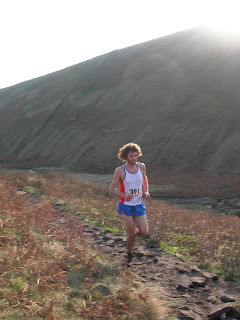 Er sorry Carl where were we....oh yes - how did you find the route today, you can't be familiar with Pendle Hill?" Carl - "It looked a bit confusing on the map, I thought we would be retracing our steps all the time, but it was interesting all the way. There were a few odd Deja Vu moments where you'd see the same spectators who seemed to be miles away from where you last saw them......but apparently they weren't!" FRB - "Would you come again to Pendle?" Carl - "Definitely, it was an amazing course. I found it very runnable and I loved it." 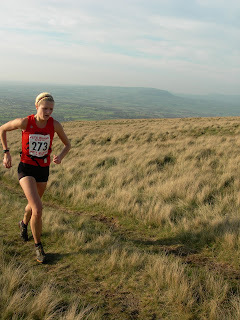 First lady today, Lindsey Brindle from Horwich who won by over 15 minutes and was 32nd overall.